Yes. 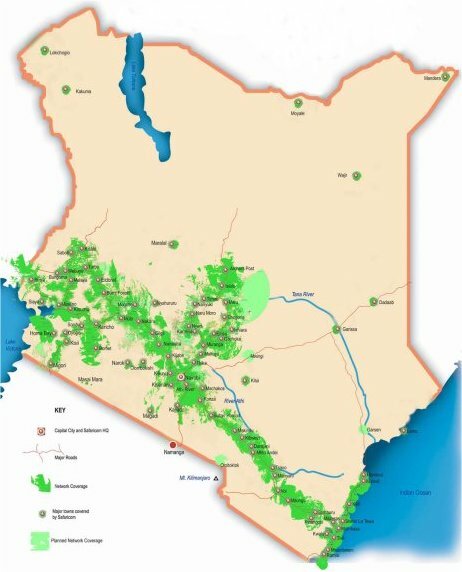 In Kenya mobile phones are used widely – much more than normal land lines. One in three adults in Kenya carry a mobile phone. However, cell phone users from America and Canada may have a problem because those countries adopted a different network system than (most of) the rest of the world. Kenya, as well as Europe, uses the GSM 900 system while the USA and Canada have the 850/1900 system. Your cell phone has to be compatible with the GSM 900 system. So while every mobile phone sold in Europe will work, only some North American tri-band or quad-band phones will work in Kenya. Check with your service provider or cell phone dealer if you are in doubt. It is possible to rent a phone from your service provider. Be aware that calling in Kenya is usually very expensive. Depending on your service provider, you’ll easily pay 3-4 dollars a minute, both for foreign calls and for using your cell phone inside Kenya. Also be aware that receiving phone calls is usually just as expensive as making a phone call, while receiving phone calls costs nothing at home! This is because most service providers have the policy that the people who call you from home, may not know that you are abroad, and therefore cannot be expected to pay international phone costs. One solution for big phone bills is getting a cheap SIM card after you arrive in Kenya, from one of the two major mobile providers, Safaricom or Celtel. If you put this in your phone, you’ll call against local tariffs. In order to use this, your phone must be SIM-lock free. At least in Europe, this is the rule with many subscription-based phones.